Cat Nap is out in this Weekend edition of The Star - print version only. When I wrote it, Scoop was still alive. Reading it brings back the day I wrote this piece. I was sitting in the living room, having a coffee, yawning after being woken up several times during the night, and wondering what to do next, when I saw Au rolling about on the sofa, and settling on his back, eyes half open. I snapped a shot and was chuffed to have it to illustrate the column. Then I went and had a cuddle with Scoop in order to get the words right in my head before writing them down. He purred up a storm as usual and shed brown fluff all over me as a special favour. Scoop passed away just over a week ago, and although I'm not crying every time someone mentions his name anymore, we're still missing him every hour of every day. I miss his loud MEOW! announcing he was back from a walk. I miss the way he'd hog the centre of the bed, and stick a claw in me if I had the temerity to move in a way that inconvenienced him. Thanks everyone for the kind messages. And I really hope there is a Rainbow Bridge heaven for cats! Scoop passed away at home yesterday, 20th September at about 6PM. The house feels so empty without him. We miss his cheerful MEOW! sounding up and down the stairs, the way he curled up with us at night, and the imperious way he ordered his meals. Au is a little bewildered so we're paying extra attention to him. It will be tough for him to be an only cat. A new Logomania came out in the Star today. Office Talk takes a look at phrases such as Hatchet Man, Nice Work If You Can Get It and Ne’er-do-well . PS Scoop's time is drawing near. He's happy and eating well but his condition is worsening. I'm dreading the next few days. Au bounced into the bedroom before dawn this morning. It's Ramadan (Muslim fasting month) so some of our neighbours are breaking fast at 4AM. Their moving about at an odd time of day peaks Au's curiosity, and being a nice cat who doesn't like to keep fun stuff to himself, he rushes around telling us to get out of bed just so we can share the fun! I threw a pillow at him but Tom gave in, got up, and kept Au company. Scoop being a sensible cat is still asleep in bed. He's seen more than 13 Ramadans and he's no longer surprised by this temporary change in lifestyle. Mind you, he is fond of a bit of chicken curry so he might be moseying around tonight to see if there's anything interesting on offer. There are two bits of good news in Malaysia today. First, Shark’s fin soup is off the menu at all functions and events organised by the Natural Resources and Environment Ministry (read about it here) and The dog-catching competition run by the Selayang Municipal Council (MPS), which offered prize money of up to RM15,000 to the public, has been called off! 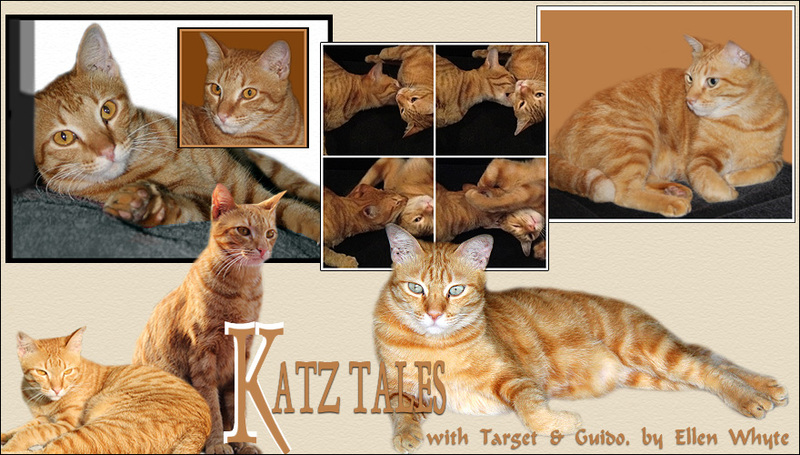 PS Katz Tales is out today in the Weekend section of the Star, the Malaysian national daily. This week's feature is Waifs and Strays. And here are Snowball and Snowflake, premium looking rescued street cats. If you live in Malaysia, enter the photo competition and win your cat a gift basket filled with goodies made by Purina. You can also email to weekend AT thestar.com.my but please keep file sizes reasonable. The Star published my Logomania Love and Limerence today, so if you're curious what limerence is, or who said, "love me, love my dog" check it out here. Here's Au, propped up underneath our dining room table. I can't see how he can snooze peacefully in this position, but he thinks it's the bees knees. I think this shot should be called "Kitty in the Forest". There's a weird fever going through the neighbourhood and it struck us down with a vengeance. For the last week or so we've been lying in bed, suffering from chills, sore bones, rashes and other lovely symptoms. The cats were ecstatic! It's the second time we've been ill in two months so the kitties are well up on their bed time. Now all is well again and we're picking up where we left off. Tom's back working on his book, I'm catching up with deadlines, and the cats are moping in bed, hoping we'll come back to them. It's great to feel good again! PS Out in this Week's Star: Detective Cats... how Scoop and Au investigate new things in the house. Guess whose tail this is?